How was Earth’s most well-known precious metal made? Image credit: ETH-Zurich, retrieved from http://www.ethlife.ethz.ch/archive_articles/121120_erzlagerstaetten_per/kupfervene_l.jpg. 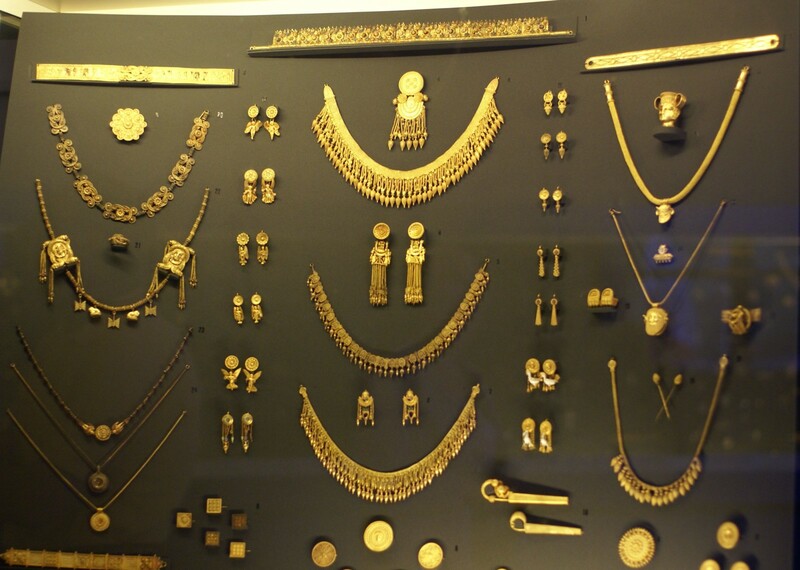 Throughout all of recorded human history, there’s perhaps no element so fascinating to our species as gold, long regarded as the ultimate symbol of wealth and beauty, and as the most fascinating of all adornments going back to ancient times. Image credit: National Etruscan Museum at Villa Giulia, of Etruscan Gold, via flickr user HEN-Magonza, at http://www.flickr.com/photos/hen-magonza/4256649637/. Yet gold is way up there on the high end of the periodic table, at element 79, making it one of the heaviest stable, naturally occurring elements in all the Universe. 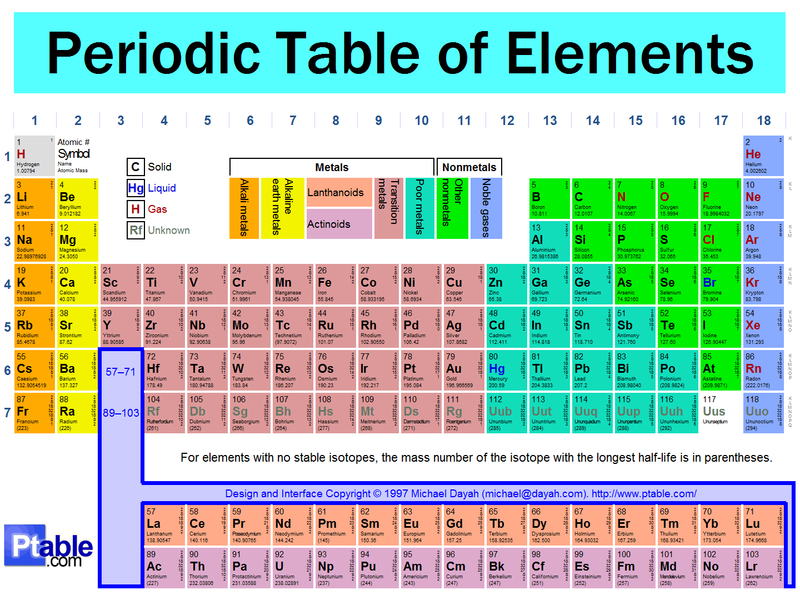 To be frank, only three heavier elements — Mercury, Thallium and Lead — are also stable. Image credit: Michael Dayah of http://www.ptable.com/. While the hydrogen on our world was created during the Big Bang, and the lighter elements were created in earlier generations of stars and spit back out into the Universe, the origin of relatively heavier elements like gold is somewhat more surprising and intricate. In particular, I came across the following infographic that excellently summarizes how this happens, which I share with you (with permission) now. Image credit: A.J. Ghergich of http://ghergich.com/; originally retrieved from http://topdollarpawnbrokers.com/one-au-some-explosion/. This is not only an amazing story, but you must realize that the vast majority of gold in the Universe most likely comes from this process, and not any other. Let me walk you through the cosmic history of the elements, and we can talk about where the heavy ones — including gold — are most likely to come from. Image credit: me, modified from Lawrence Berkeley Labs. In the early days of the Universe, there was nothing but a hot, dense sea of plasma: matter-and-radiation that was so energetic that no two particles could bind together without being immediately blasted apart again. Even individual protons and neutrons, the instant they would find one another, would run into a photon energetic enough to blast them back into their constituent particles. Over time, however, as the Universe expanded, it also cooled, and that meant that these heavier nuclei that were forming could remain, stably, for an indefinite amount of time. The lightest elements in the Universe — hydrogen, helium and their various isotopes (and a little lithium) — were formed in this way: in the aftermath of the Big Bang itself. 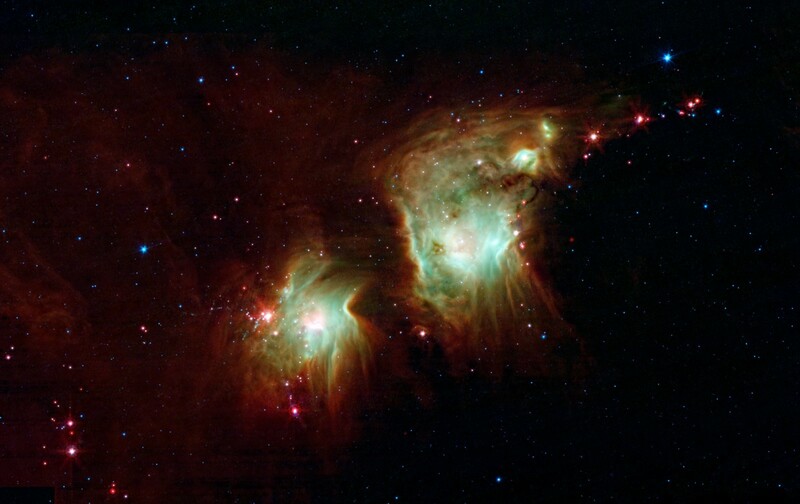 Image credit: Spitzer Space Telescope, NASA / JPL-Caltech. But over time, gravitation worked its magic, contracting this now-cool matter down into dense molecular clouds, and eventually into the Universe’s first stars. 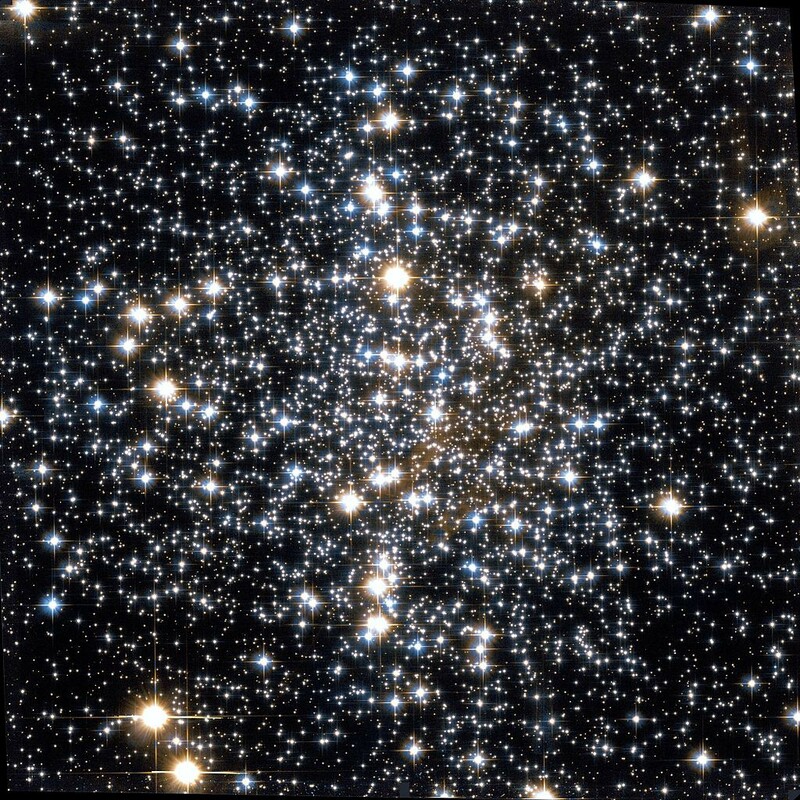 Made up of mostly hydrogen with a little bit of helium, these are known as Population III stars: stars with practically no elements heavier than helium in them. These stars not only fused that hydrogen into helium in their cores, but the heaviest ones went on to burn helium into carbon, and then to fuse carbon, oxygen, silicon and sulphur into elements all the way up to iron, nickel and cobalt in their innermost cores! 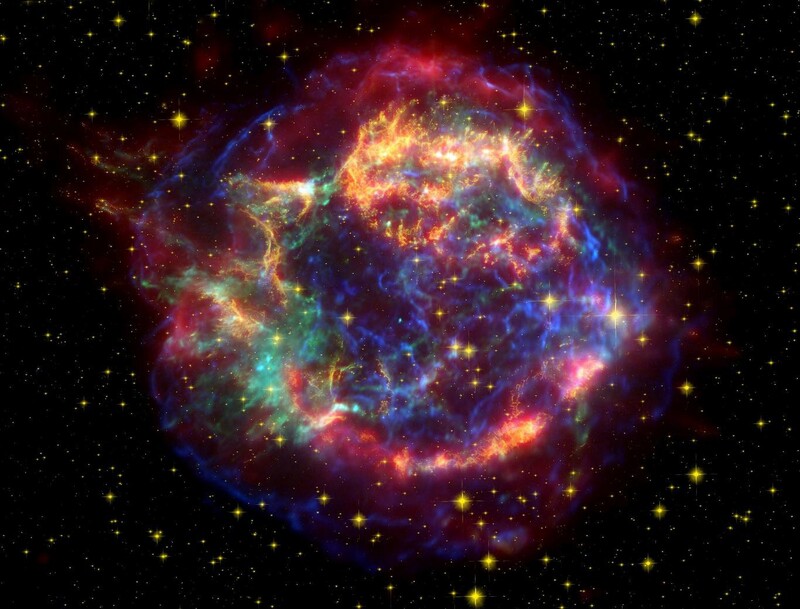 Eventually, when the cores of these stars run out of burnable fuel, they collapse and explode in a Type II supernova! Image credit: Nicolle Rager Fuller / NSF. Although the innermost cores will collapse down into a black hole or (more commonly) a neutron star, the outermost layers get ejected back into the Universe. These layers, the ones rich in hydrogen, helium, carbon, oxygen and some other relatively light elements, are returned to the interstellar medium, where they can become part of future generations of stars. Image credit: Spitzer Space Telescope (red), Hubble Space Telescope (orange), Chandra X-ray Observatory (blue and green) / NASA. Yes, it’s true that the same explosion that creates a core of neutrons also ejects a large number of neutrons, allowing elements much heavier than iron to form rapidly, reaching all the way up the periodic table to heavy, unstable elements that have all radioactively decayed away here on Earth. But it isn’t enough — when it comes to explaining the Universe — to simply create the heavy elements; we need to create them in the proportions we observe them to exist. When it comes to the relatively lighter elements, like carbon, oxygen and silicon, they do in fact seem to originate from this process. Image credit: NASA / ESA / Hubble Space Telescope, via WikiSky. But when we look at population II stars, which are the generations of stars that arise from the Universe once it’s been enriched by these supernovae, we find that although they are rich in these light elements, they’re woefully deficient when compared to our Sun when it comes to elements like iron (which is just element 26) and heavier. You see, our Sun is known as a population I star, and it’s very similar to other stars in the plane of our galaxy, and all spiral galaxies for that matter. It’s true that it has even more carbon, nitrogen, oxygen, and silicon than the population II stars, which indicate that there have been even more generations of stars that have lived, burned their fuel, gone supernova, and returned that material to interstellar space before our world was created. But the ratio of the truly heavy elements — from iron to tin to gold and beyond — is inexplicably higher than these ultra-massive stars going supernovae alone can explain. Image credit: Wikimedia Commons user 28bytes, via CC-BY-SA-3.0. Something else must be happening to account for these heavy elements. Something else must be creating these elements, and it must be creating them in a different fashion than how the other, lighter ones were made! Up until recently, all we had was a theory about how. 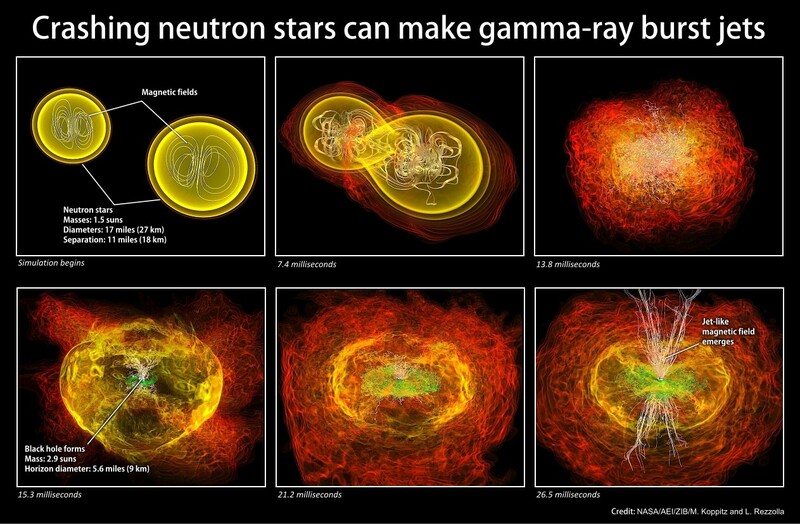 Image credit: Dana Berry / Skyworks Digital, Inc.
Space is full of neutron stars left over from the ultra-massive stars that formed early in the Universe; there are estimated to be literally billions of them swarming through every Milky Way-sized galaxy in existence. For the most part, these neutron stars are the only ones in their star system, but every once in a while, they were once part of a binary or trinary system where two of the stars were massive enough to leave neutron stars behind. We know this to be true because occasionally, neutron stars emit beams of radio energy that “pulse” at us as they rotate: this is what pulsars are. And right here in our own galaxy, we’ve discovered evidence of a binary system where both stars are neutron stars that pulse at us: a double pulsar! Thanks to Einstein’s General Relativity, we know that orbits like this decay over time, and given enough time, these pulsars will eventually decay into one another and collide. 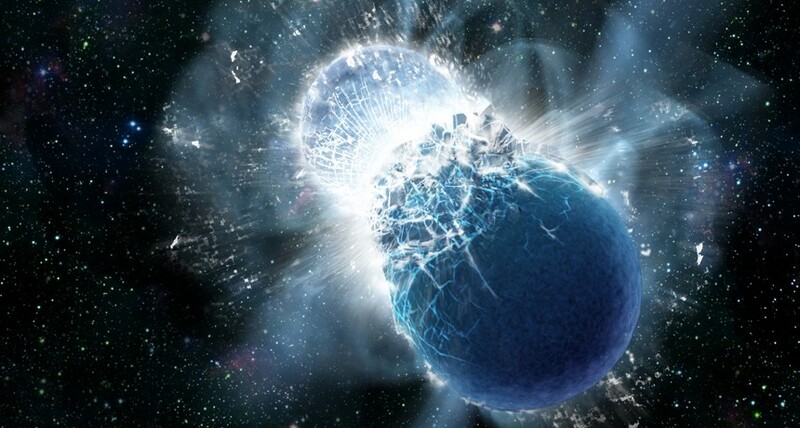 What do you think it is that happens when two neutron stars, that is, when two objects approximately the mass of the Sun, the size of a mid-sized city and made out entirely of neutrons, collide with one another? Well, the result is catastrophic! They may (or may not) leave a black hole behind, but what definitely happens is that these neutron stars are destroyed in just a fraction of a second, ejecting an estimated thousands of Earth-masses worth of heavy elements into the Universe! This is where the majority of the Universe’s gold, platinum, mercury, lead and uranium come from, and where practically all of Earth’s stores of these elements come from, too. When you consider all the generations of stars that lived and died to create the elements on Earth, you had better not forget the neutron stars — stars that died twice: once in a supernova and once in a gamma-ray-burst — when you think of the heavy elements! Image credit: NASA / Albert Einstein Institute / Zuse Institute Berlin / M. Koppitz and L. Rezzolla. 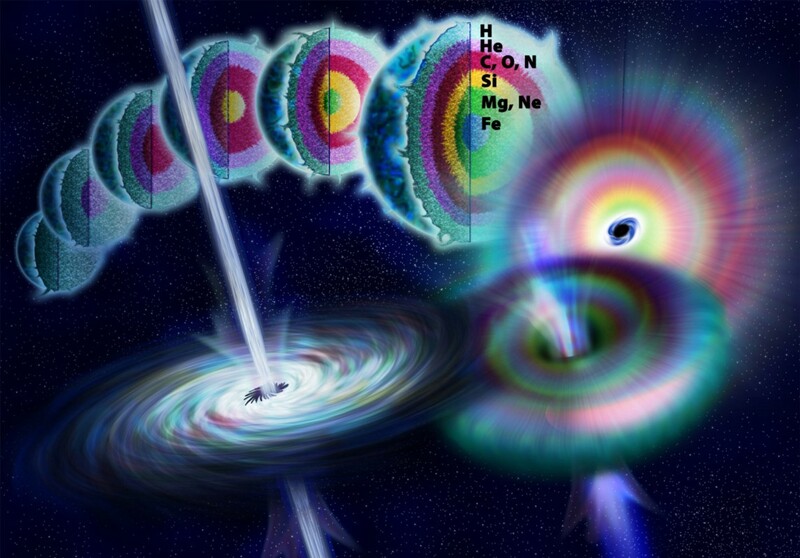 It’s estimated that in a typical, Milky-Way like galaxy, an event like this occurs every 10,000-to-100,000 years, meaning that there were somewhere around a hundred-thousand to a million of these neutron star mergers occurring in our galaxy, enriching it with the heaviest of elements, prior to the formation of our Solar System. It’s very rare to see a popular infographic created by a non-specialist that’s this scientifically accurate (the only thing I’d change is that there are probably only about 20 Moon-masses worth of gold, specifically, created in a single merger like this, not 20 Earth-masses; there are a lot of elements to go around), so kudos to A.J. for a job well done. And, of course, also, an extra thanks for letting me share it with you. And that’s the cosmic story of not only gold, but all the heavy elements present on our world today! Have a comment? Leave it at the Starts With A Bang forum on Scienceblogs!